A story about your dreams coming true…then throwing up a bit. Double lung transplant recipients like my wife, have to deal with a lot of challenges but false advertising should not be one of them. 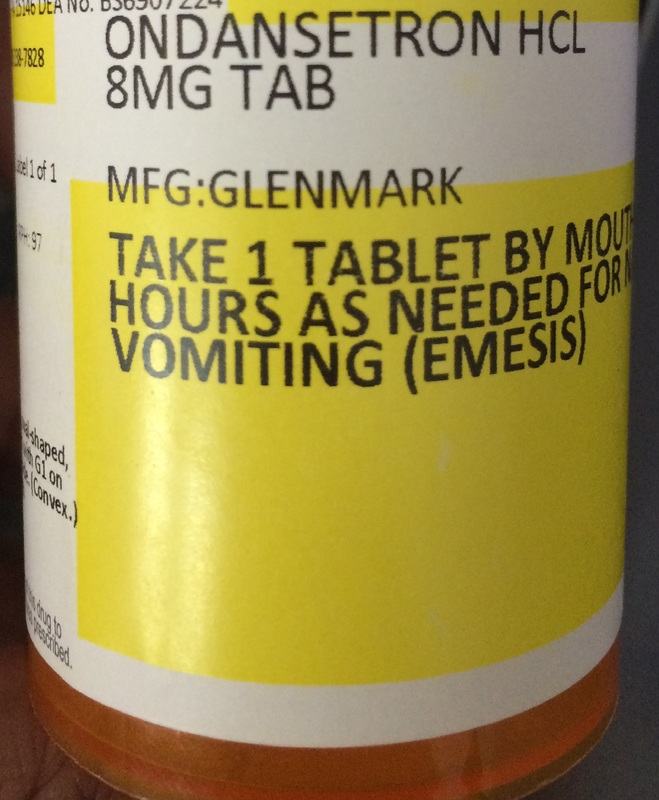 Pictured here, is a medication that she was prescribed by her doctor to stop nausea that she unfortunately experiences almost everyday. It is called Ondansetron (pronounced “On-DANCE-a-tron“). There is a slight possibility that it is not pronounced this way but I do not care. While she is On “DANCE-a-tron”, an insinuated side effect would be that she could become elated and feel strong urges to dance more frequently. I am sorry to tell you, that is not the case and has never been the case with this mislabeled drug! Typically every morning shortly after Rebecca wakes up, she experiences pain and nausea. We are 3 months out from her double lung transplant and she understandably still has a fair amount of pain which has fortunately been diminishing slowly week over week. Some of her stomach issues have resolved but it is unpredictable if and when a meal will upset her. She does have cystic fibrosis which can increase digestion issues and stomach pain. This has become worse over the years but we have worked to figure out the cause. Going gluten free seems to have helped but these gastrointestinal issues can pop up at any time. We manage space between meals, the types and quantity of foods, and have even experimented with OTC and natural remedies. A drug name so powerful suggests that it could overcome any propensity that her digestive tract has for acting up, and make her feel so good that she wants to dance. I will say that being on Dance-a-tron helps take the edge off these issues when they come up though it does not resolve them completely or immediately. I would not expect any drug to be perfect in this respect and it does seem to help if she can take it quickly enough. However, it is frustrating to see her laying on the couch, in pain and discomfort waiting for the nausea to pass when all logic points to the fact that she should be dancing. Don’t get me wrong, we have danced since the surgery and she has had some good mornings. There is nothing better than stringing together a few solid hours and her comfort level has been MUCH better when compared to earlier this year. But…I am still waiting for that key moment when Becca is dancing through most of the day. Being on Dance-a-tron is not all it’s cracked up to be. We will continue to try to figure out how to resolve the root cause of the nausea. Though that will ultimately mean no longer being on Dance-a-tron, it might lead to more actual dancing. I planned to write a stern letter to the manufacturer but now that I’ve spent my free time writing this, it’ll have to wait. In either case, I’ll continue posting updates to the facebook page “The Rebecca Martello Poole Lung Transplant Journey” while using this forum for longer posts.